At Bart Fireside, we not only carry fireplaces, stoves, and gas logs, but we also sell grills and even design outdoor kitchens. Here in the Columbia, SC area, we are fortunate to enjoy warm weather for most of the year, so we have more time to spend in an outdoor kitchen. Even if you think the winters here are too cold to be outside, we can add an outdoor fireplace to keep you warm in your new living space. Adding an outdoor kitchen requires a lot of planning to make sure you will have everything you need for this new space. To help you get started on planning your new outdoor kitchen, we would like to share some tips with you that will make this part of the project a bit easier. 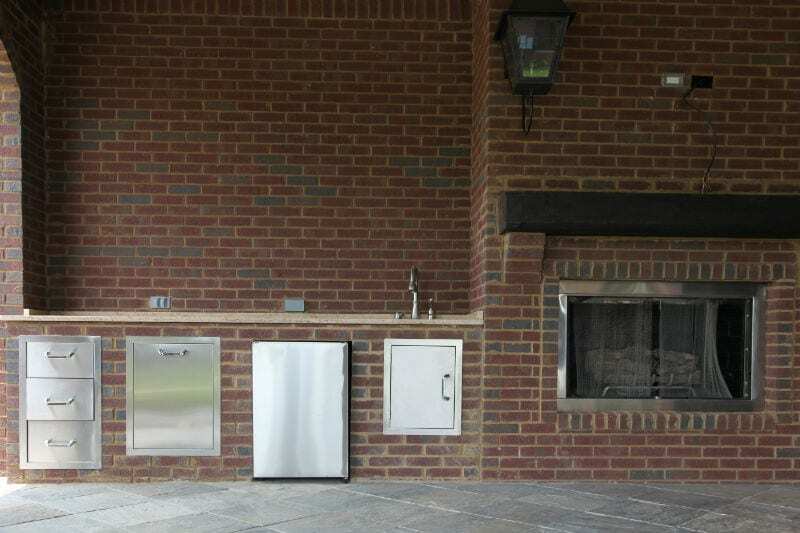 Deciding where to put your outdoor kitchen is an important choice. You want to be sure the smoke from the grill will not blow back into your house, so you will have to have an idea of the wind pattern in your yard. If you do a lot of entertaining, you may want to put your outdoor kitchen as close to your indoor kitchen as possible. This will help when you have to carry heavy dishes outside. You will also want to be sure your new outdoor kitchen will not block your favorite view of the outside from your home. Finally, think about safety. You do not want to place several grills right by the place where your kids like to ride bikes or play Frisbee. Think about how many appliances you will need. And, when you decide on the number of appliances, you will need to know what size you will need. 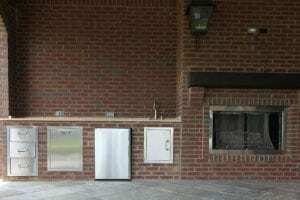 According to Porch, these answers are one of the most important bits of information needed when designing the space of your outdoor kitchen. You will want to have enough space between appliances, and you will want your counter heights to match the appliances’ sizes. Remember the ideal working triangle in a kitchen includes the refrigerator, sink, and oven when you are planning where to put appliances. Don’t forget about storage space. Often, when planning an outdoor kitchen, people will forget all about having the necessary storage space. Your outdoor kitchen will be just like your indoor kitchen, and you will need room to store cooking accessories, dishes, and silverware. Keep in mind that this storage space will need to be waterproof and to be able to stand up to changes in temperature. Deciding exactly how much storage space you will need is another important step in planning the outdoor kitchen of your dreams. These tips are great for getting you started on your plans for an outdoor kitchen addition. Contact us at Bart Fireside to talk to our staff about this exciting project. We are happy to help you with the rest of your plans, and we are here to guide you through the entire project.